I have a new series of articles that will be focusing on trend reporting using PowerShell and SQL. Be sure to check them out and let me know what you think! 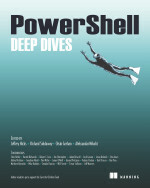 This entry was posted in powershell and tagged excel, mcpmag, Powershell, SQL, trend report. Bookmark the permalink. Is there a special reason you calculate the usedspaceGB from size and freespace, instead of just converting the usedspace value from the table to GB? That would be a fail on my part. 🙂 The better approach would be to take the UsedSpace from the table and convert it to GB rather than wasting cycles on calculating for UsedSpace like I did. Must have been napping while writing out that code block. Aww, that ended right now before the good stuff! Always keep them wanting more, eh? 😉 Thanks! I was back and forth between how I was going to split this up into 3 parts and figured it would make the most sense to do the data gathering as one part and then cover the SQL part as the next section.